Our long list of happy clients is due to our consistent, speedy turnarounds, conscientious customer service, and unparalleled product quality. Our fine-tuned processes and printing capabilities come from over 40 years of experience making personalized playing cards and customized playing cards being one of the most established manufacturers in the world. All our custom playing cards are Offset printed on state of the art Heidelberg printing machines and just as professional casino decks are printed. The digitally printed promotional playing cards are printed on state of the art indigo by HP. 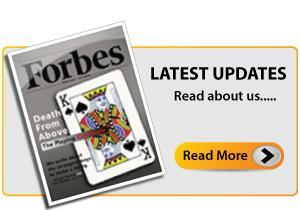 Custom Printed Playing Cards are a great way to present your message with impact. It puts in the hands of your target audience a fun and memorable gift that they may enjoy for months or even years, always remembering your brand and organization. 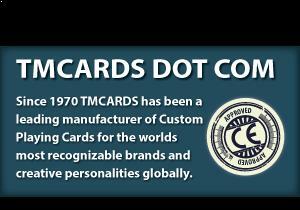 Cards customized by TMCARDS are a great draw for game makers and magicians. Game makers are always looking for manufacturers of custom playing cards, custom card game, and custom game cards as they are popularly known worldwide. 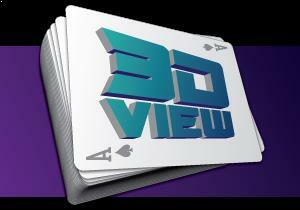 Custom made playing cards give a whole new dimension to branding, advertising and educating the masses bringing to the fore an ideal marketing tool that is now the key mantra of companies and institutions to showcase and brand their strengths. 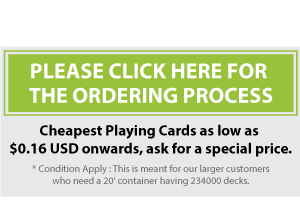 Custom playing cards manufactured in smaller quantities is extensively used by magicians, game developers and those who also wish to test market their games before going in for the long run. One could customize both sides of cards and needn’t have the pips or suits on the faces. Personalized Playing Cards are a great hit with companies and individuals alike that would like their cards personalized with their company logo, products, and services. The personalized playing cards can have a whole lot of add on value to a marketing campaign by having each card clearly depicting their products and services in a clean and systemized fashion. Promotional Playing Cards made in collaboration with our design department can be one of the lowest CPM marketing vehicles available to advertisers, marketers, and agencies. Organizations of all sizes can benefit from putting a fun and reusable item, emblazoned with their brand and message. Above 1000 deck please ask for a quote. Printed Tuck box @US $119 additional for above orders. Plain White Tuck Box complimentary with any of the above orders. For 1 to 100 decks plastic box will be complimentary on request. Inclusive of shipping anywhere in the US. I have received the playing cards, they look great. And your timing was very great. Thanks for that.Thanks again. Wanted you to know that we received the quality playing cards and they are terrific. Thank you very much for all your help!